Blockchain Bonnet by Joe Chiappetta is available as rare digital art on the SuperRare marketplace. 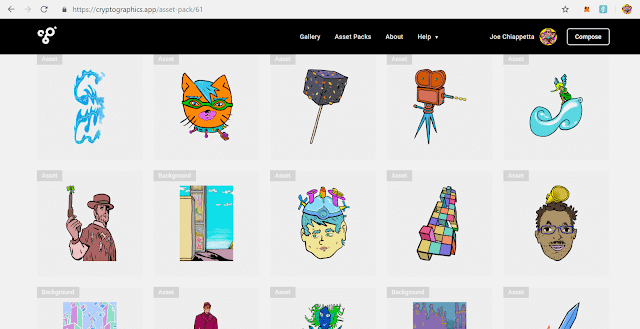 An overview of opportunities for artists on the blockchain are covered here, including rare digital art, crypto community graffiti, and online crypto social meritocracy. It’s a pretty interesting time to be alive. Especially as an artist, I have seen rapid opportunities opening up for creative people. This has been largely due to advances in cryptocurrency, blockchain technology, and high speed mobile internet. With new technology often comes new terminology, methodology, and of course, opportunity. 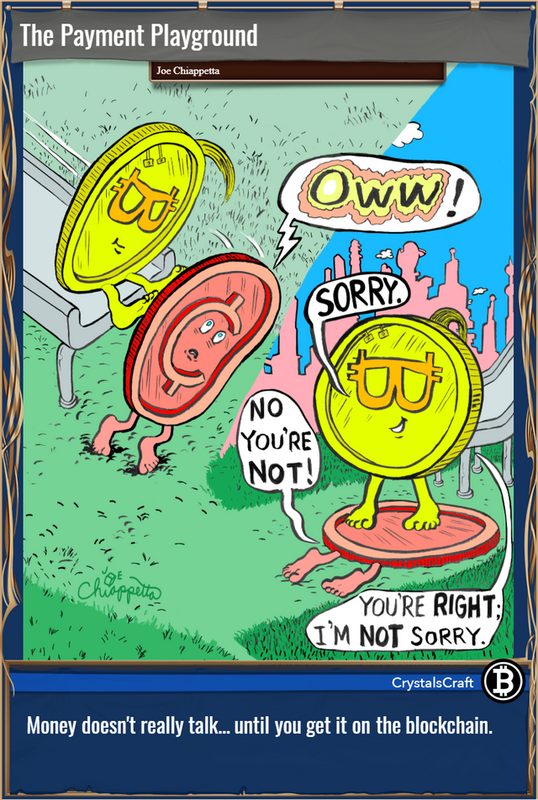 Such is the case with a wide classification of artwork known as crypto-art, which can be very loosely defined as artwork having something to do with cryptocurrency. Of course, the broad category of crypto-art includes physical artworks where the subject matter has to do with cryptocurrency, such as a tangible painting on canvas featuring a Bitcoin logo. In fact, such artworks are probably the first types of modern crypto-art. Yet this article has more to do with a newer phase of crypto-art: specifically digital art that is powered by blockchain technology. 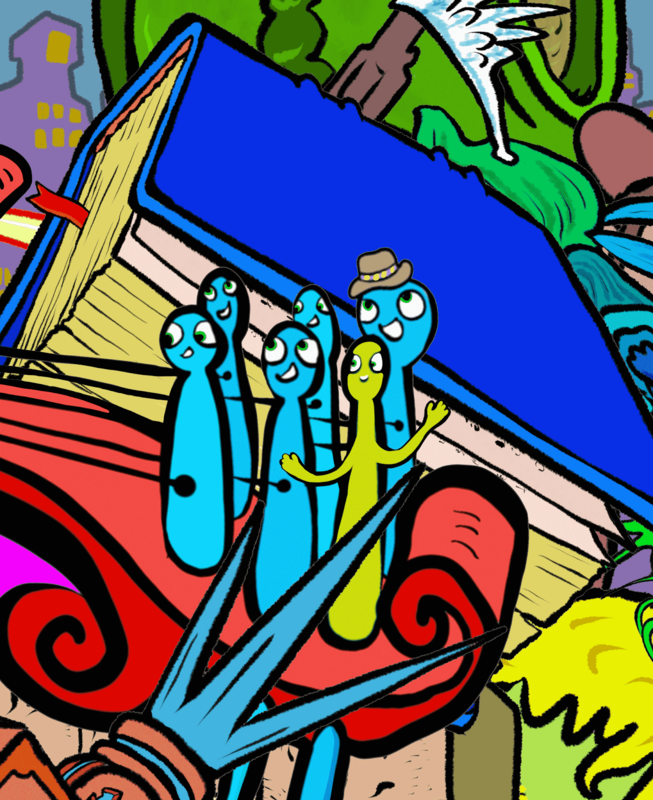 Squiggly Rare Silly Chain by Joe Chiappetta is rare digital art available on the MakersPlace marketplace. There are actually more than 3 categories of opportunity now available, but the opportunities that I chose to highlight in this crypto-art article are in their infancy yet have large growth potential, plus they are widely available now to every artist with high-speed internet and a computer. While I absolutely believe that this is a time of incredible and unprecedented opportunity for artists because of cryptocurrency developments, I must also add a disclaimer. Cryptocurrency is fairly new technology, somewhat unregulated, yet subject to certain tax laws and often volatile in its US Dollar equivalent highs and lows. In other words, if you do get into this field and start earning a lot, definitely consult a tax professional and know that there’s a lot of price fluctuation in the cryptocurrency market. Moreover, if you’re a risk taker, slightly tech savvy, willing to learn the tax implications, and not faint of heart, pay close attention to developments in this space, and perhaps even test the waters. The first opportunity for artists that has become new through cryptocurrency would be in the category of rare digital art, also known as crypto-collectibles, or even digital collectibles. I personally prefer the term rare digital art, but this field is still so new, that no one really knows which term will stand out above the rest. The rare digital art industry is comprised of limited edition digital artworks that are each attached to a unique cryptographic token--also known as a cryptocurrency. 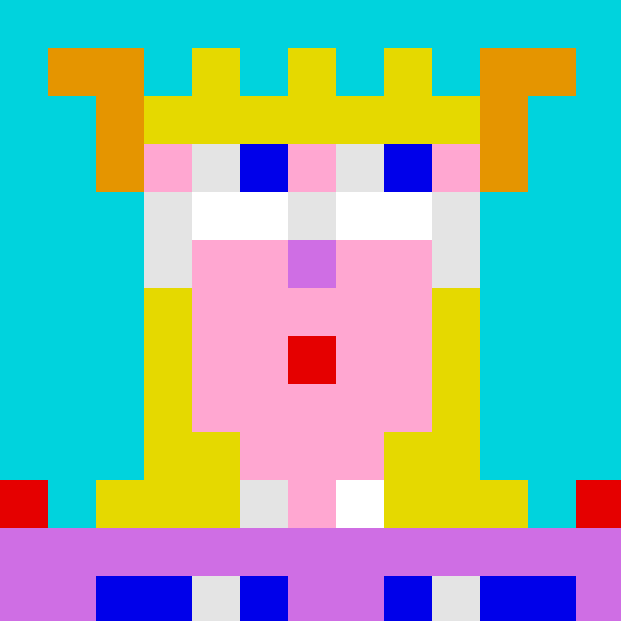 A record of who owns this token and its attached art is readily available on a specific blockchain. Cryptocurrency runs on a "chain" of typically unalterable data, grouped in sequential "blocks." That's where the term blockchain comes from. Often for those first hearing about the concept of rare digital art, an important question comes up. "Why would anyone want to spend money to own digital art when anyone can just copy the artwork file for free from the Internet to their own computer?" The answer is just as simple. Indeed, some will simply copy the file from the Internet. Yet certain collectors want more. These collectors will want to own the digital art that was personally issued directly by the artist in verifiably limited quantities. Blockchain has made this possible, and collectors are already doing exactly that. Moreover, many of these collectors choose to show off their collections to the public. Again, blockchain has made ownership of digital goods a new reality. Another concept to keep in mind is that there are many different blockchains that have been created. In fact there are well over 2,000 separate blockchains, yet many of them will amount to nothing special. CoinMarketCap, a site that lists key metrics on most cryptocurrencies, currently shows that there are at least 2,070 different cryptocurrencies. Gratefully we can just focus now on the main blockchains that are in the widest use today to release and sell art directly on the blockchain. Currently there are only a handful. The blockchains that are currently in very wide usage to issue rare digital art include the Bitcoin blockchain (through an add-on crypto-data layer called Counterparty), and the Ethereum blockchain. Since blockchain data can't be easily altered, and the data is verifiable by anyone, digital scarcity is now a real option for any piece of digital artwork. This means that digital art can now be issued in limited editions and collected for its level of rarity on the blockchain! Such collectible art is packaged in at least two different forms: (1) rare digital game items and (2) independent rare digital artwork. Rare Digital Game Items: This refers to various unique digital game items that interact and function as game pieces within a larger gaming ecosystem. One fine example would be the Spells of Genesis blockchain cards that are playable in their online game and tradeable on the blockchain. 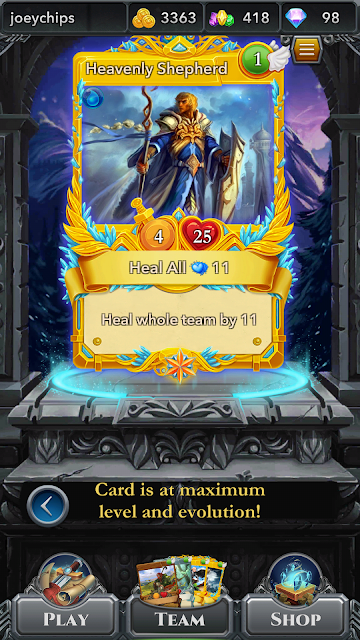 Incidentally, EverdreamSoft, the Swiss company that makes this cool game and issues its blockchain cards, holds the distinct honor of being the very first to ever issue rare digital art. Independent Rare Digital Artwork: This refers to stand-alone, limited edition digital art pieces, both as static images as well as animated artworks. I have sold an incredible amount of my comics in the rare digital art marketplace. Naturally, I look forward to issuing more of my art there, as well as other key places. Many markets already exist out there for rare digital art, additionally known as non-fungible tokens (but I sure hope that odd, techie name referring to the art's non-interchangeable and unique nature doesn't stick). There are many additional rare digital art markets, with new ones launching every quarter. I suppose no one person--other than a die-hard crypto-art researcher--could cover them all thoroughly. The markets that I use are working for me and have a nice track record of professional accomplishment. Of course, as time and opportunity permits, I am open to trying additional markets. As a specific market for minimalist rare digital art, CryptoSketches deserves a bit more attention because of its groundbreaking nature. When I say minimalist, I mean line drawings that take about 40 strokes or under to complete. It is the only site I know of currently where anyone can instantly make a minimalist drawing directly into the CryptoSketches drawing app and that art becomes a piece of finished rare digital art on the Ethereum blockchain within the hour (or as soon as the transaction is cleared on the Ethereum network). This means your art is available for sale with no human approval necessary--and in the same hour that you created it. Artists will need much more Ethereum than usual to issue their art in this particular platform. 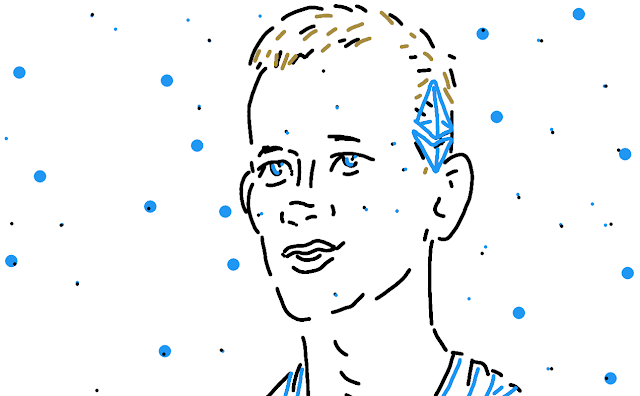 On other Ethereum platforms it currently only costs a few cents to issue rare digital art. But on CryptoSketches, the transaction fee to issue rare digital art is currently between $3 and $6. My guess is that this is probably because there is way more data in a CryptoSketches smart contract since each drawing's vector data is contained in the transaction, making it more expensive to run that transaction through the Ethereum network. I think of these expense, high or low, as if they were postage costs to send my work to a global market. That expense also weeds out spam artists who would otherwise flood the market with junk. Another nice feature of CryptoSketches is that when you view finished pieces in the market, a replay of the drawing process is automatically generated. Currently, this might only be viewable to those who have the MetaMask browser installed. If you do have MetaMask, see the drawing replay example here of my ETHmobile art. These unique features make CryptoSketches first-in-class for being the only app (so far) for direct draw-to-market issuance of rare digital art that also includes a video replay of the creative process. I am going to rephrase these features because it is a huge innovation for the entire art world. Think about it; where else can any artist quickly draw digital art and in that same action, directly and immediately issue that art onto the market for sale as a one-of-a-kind piece of rare digital art? Since this is a vector based app, the built-in video-redraw features also gives CryptoSketches that added bonus of being able to review the exact creative process for each piece of art issued on its marketplace. This video replay turns the art into more than a static image owned by a unique collector on the blockchain. That collector is also buying the exact artistic process. In other words, what the collector also owns is not just the finished art, but also the code that replays the lines that made the art. How cool is that? Cryptographics, mentioned earlier as another fine market for rare digital art, is also groundbreaking in so many ways. It is a generative art site, meaning that artists go there to add (or generate) unpredictable elements of randomness to their art. 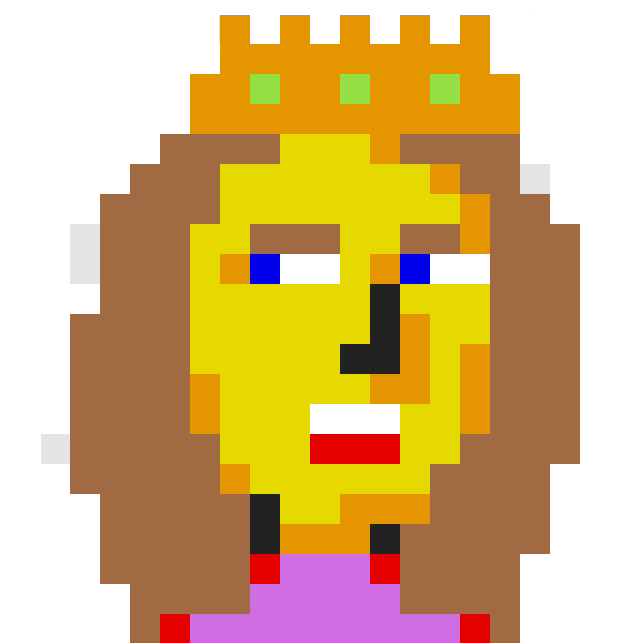 Additionally on Cryptographics, one artist's work can even be combined automatically with another artists work. This creates new hybrid artworks, where all contributing artists get a portion of the hybrid art sale for each crypto-collectible generated. 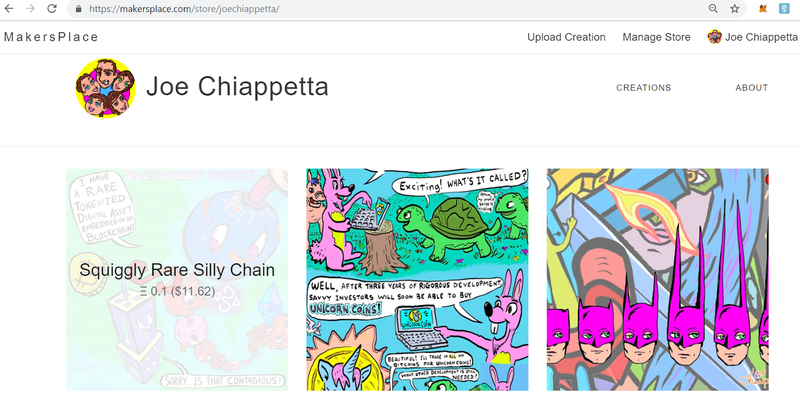 While being one of the newest sites that I issue rare digital art through, Cryptographics has instantly earned my respect as one of the most innovative and useful tools that a visual artist could utilize in this ever-changing digital age. In fact, I even wrote a more in-depth review of Cryptographics after using it extensively. Asset pack created by Joe Chiappetta on Cryptographics allows others to create crypto-art with Chiappetta's art. Another new and exciting opportunity for artists that has become possible due to the rise of cryptocurrency is not as widely known. Yet I believe it can be an area of noteworthy growth for--not simply the super-talented artists--but also for anyone with even an ounce of creativity in their veins. However I must add that of all the categories mentioned here, this one is the weirdest and most speculative. Pixelated Superhero by Joe Chiappetta was drawn into a portion of the pixEOS Paint online community canvas. I call this category of art opportunity crypto community graffiti. Basically how this works is there’s a big online canvas and artists come in and buy space on the canvas. Actually it's more like renting a communal canvas space, and creators are drawing, writing, or designing all around you, and even over you. 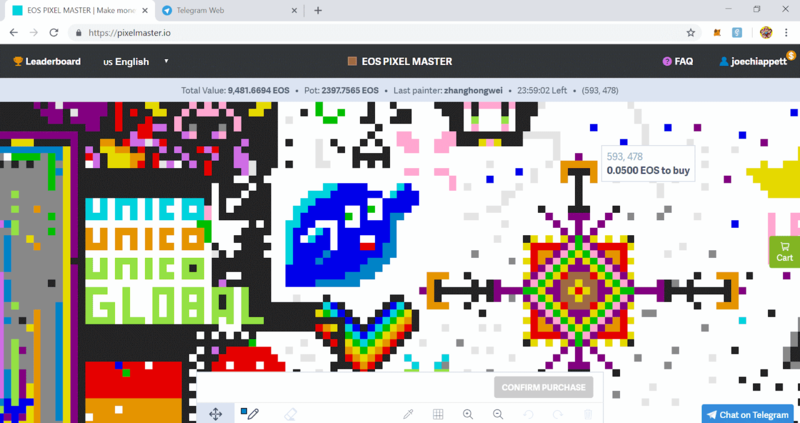 Screenshot of EOS Pixel Master, a crypto drawing game that has ended. Think of multiple people at the same time or at various points in the day going and drawing in different sections of the same giant wall. Then new artists come in and they can either try to find open areas of that wall or they could buy the space that the previous artists have drawn upon. 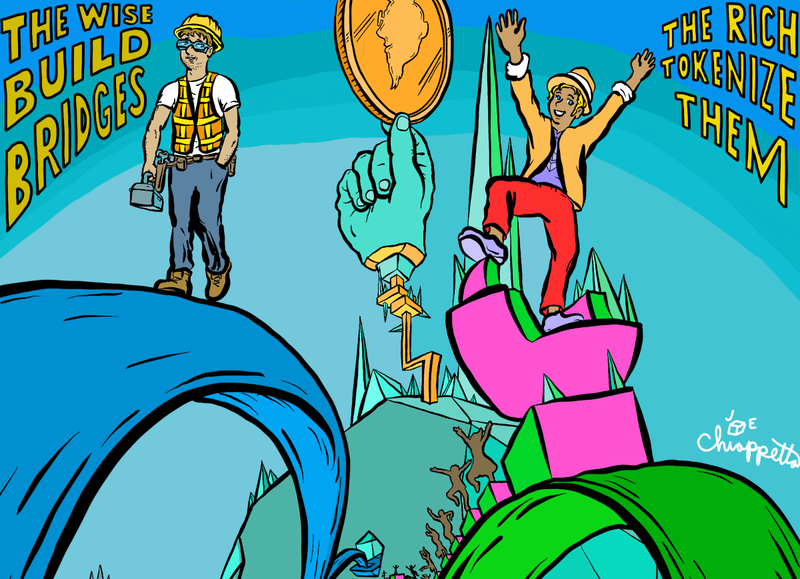 When a new artist comes in and buys the space to draw over what the previous artist drew, the previous artist gets more cryptocurrency from the new artists activity. And the amazing thing about this whole process is that all the contributors to the giant art project, new and old, earn more cryptocurrency as new artists come in and draw on this collective canvas. 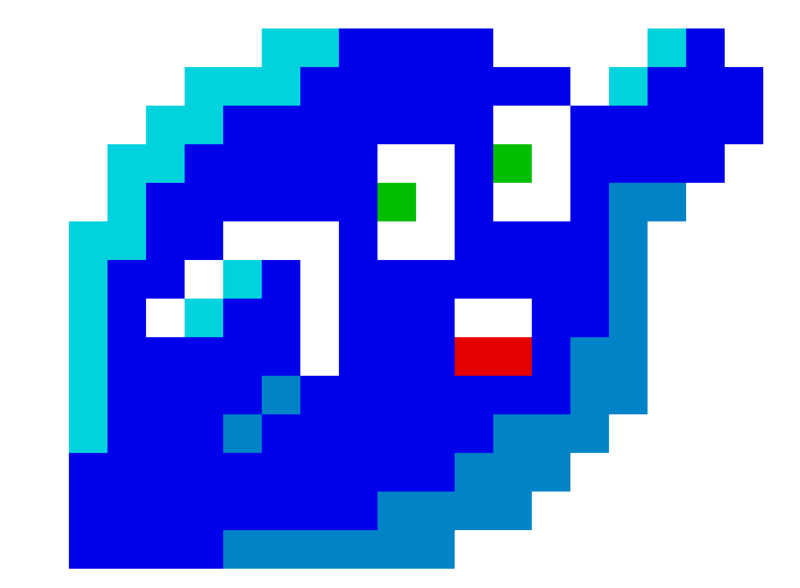 The ONO social network mascot drawn in pixels. A current active example that I have seen of this type of artistic opportunity would be at pixEOS which runs on the EOS cryptocurrency network. There are a number of other inactive sites that have done this on EOS in the recent past: Pixel Master as well as Pixel Fun. Yet pixEOS has active--and possibly even visionary--development, a lively community, and even plans to also have their own rare digital art market! 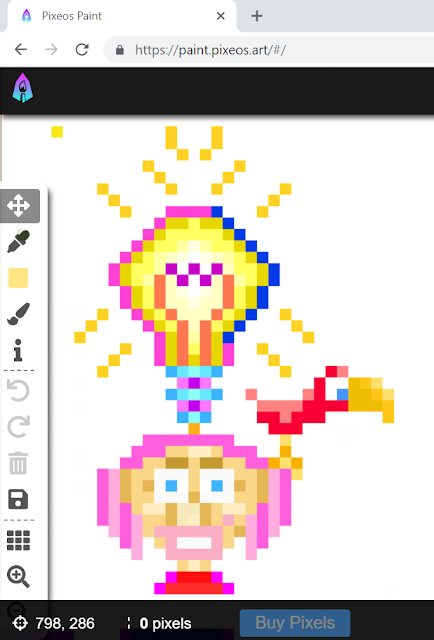 Pixelated person with lightbulb and bird by Joe Chiappetta, drawn in pixEOS Paint game. 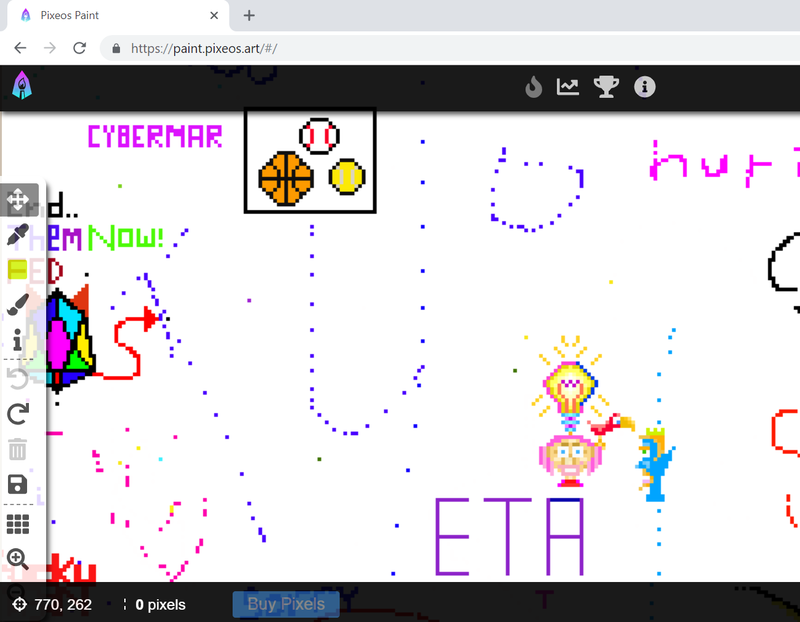 Screenshot of pixEOS paint includes drawing by Joe Chiappetta and many others. The whole concept of these sites expands boundaries for the art world. 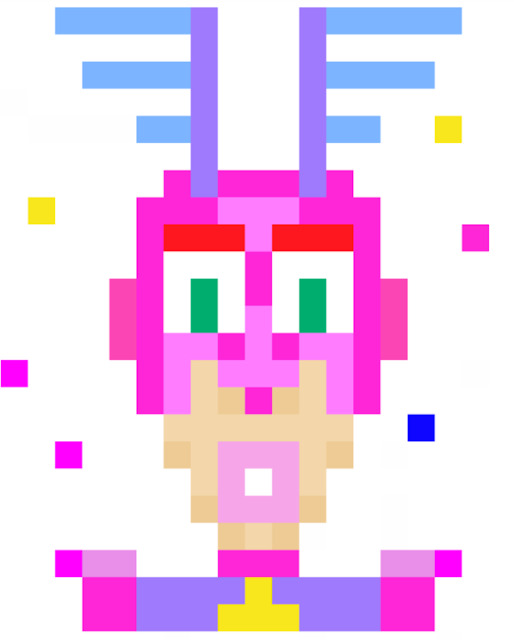 It makes the act of creating incredibly more interactive and full of surprises (both pleasant and unpleasant). To get started, you need a cryptocurrency called EOS as well as a crypto wallet program called Scatter which works on a desktop computer. Once you get those technical requirements out of the way, now you're ready for the fun stuff to begin. This category of new crypto-arts opportunities turns creativity into an impermanent-visual-social-art-gambling-game-experiment as well as a rental scheme. It is all those things in one! I am serious. To expound on a cautionary note, a pyramid investment component is really just one aspect of this category's strange and controversial nature. I use the term "pyramid" because in some cases, the earlier you get in on drawing in these spaces, the more your earning potential could likely be. Yet "late-comers" also have a chance to earn too because you never know how long the canvas will keep going. 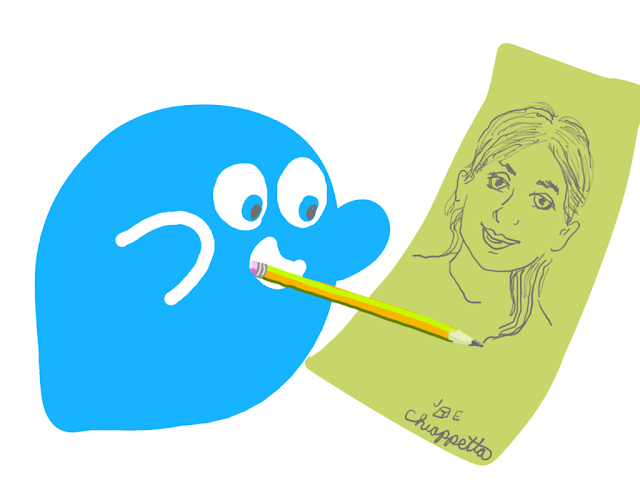 And an even newer user could draw over your work, thus earning you some fresh cryptocurrency. Does all this sound a bit crazy? And perhaps wild? Yes. I think that's the point. But it's real... in the digital crypto-art world. The ever changing essence of such giant collaborative art pieces and the mix of levels of talent and seriousness on theses canvases really does make this an art experience like never before. It’s kind of like you’re in a middle school art class working on a mural with all different types of people; this includes those serious about art, those semi-serious about art, those who don’t care about art, and rebels who want to wreck your art with swear words. It makes for a unforgettable and always unpredictable outcome. An additional new opportunity for artists is in online crypto social networks. This would be sites like Steemit, ONO, Whaleshares, Minds, Trybe, Creary, and Murmur. On any of these places, creators can post their art, not merely for "likes" that don’t transfer into value, but "likes" that transfer into earning cryptocurrency that can have a real world financial value: some only in fractions of a penny, yet others in higher dollar amounts. Steemit screenshot of Joe Chiappetta posts shows upvote earnings in USD. However keep in mind that for most people, these crypto-social media earnings will not be enough to live on, and I would guess that some of these sites will not thrive since the market could get flooded or just plain fickle. Remember MySpace? There are only so many social media sites a person can be active on at any given time. Most of these crypto social networks could also be called crypto social meritocracies. I use the term "meritocracy" because on these sites, the more you contribute, in terms of time into the community and value-added to the community, the more your presence there often earns you a reputation score that in turn, earns you more cryptocurrency. In other words, this is artistic social activity and earnings based largely on what you do, not on race, social class, gender, or past accomplishments. These meritocracies measure what you contribute now for the community, usually in the form of content creation as well as thoughtful curation of other people’s creative work. 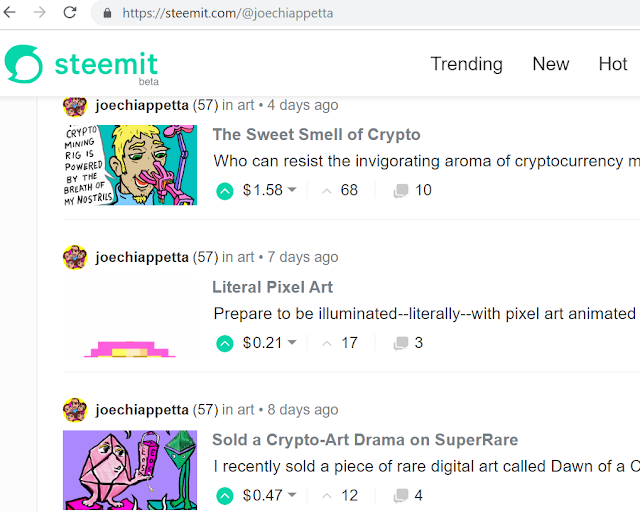 I am most active on Steemit, under the user name of joechiappetta. And I do maintain a decent presence on the other crypto social sites mentioned above. Mind you, this is not a detailed review of any of those specific networks. But each of these platforms have unique features and compelling value propositions to get involved creatively, network with new people, and earn some cryptocurrency in the process. Just keep in mind that each crypto social network usually mints its own unique cryptocurrency. Some of these crypto coins are worth a decent amount if you accumulate enough of them over time. Yet others are worth almost nothing. 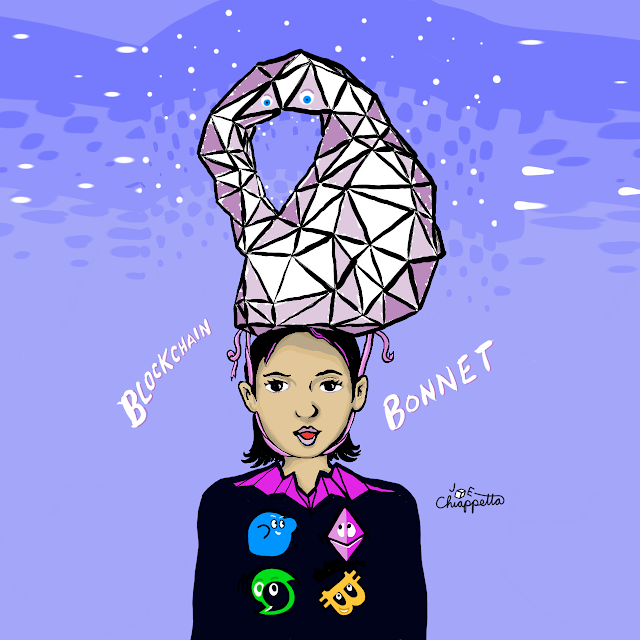 Summing up the category of Online Crypto Social Meritocracy, if you want to post your artwork on the web and earn some cryptocurrency while doing so, this is a definite way to do that. I am not saying that non-crypto-social media has no value. In fact I still use such sites for publicity, yet in a much reduced capacity because there is no financial compensation for contributing to these sites. Therefore, as an entrepreneur, I have to look at what gives the most value for my time. Many artists already post their work only on non-crypto sites like Facebook, Instagram, and Twitter, yet get absolutely no monetary compensation in return for their consistent contributions to these sites. Been there. Done that. Might as well move to where some compensation exists and start getting paid in crypto for our time on the site. Then in the process, we may also find a new tribe of like-minded, creative-crypto people. With all of these new categories of opportunity for digital artists, there is a bit of a learning curve to know how to access the full benefits of these new systems--or even where to start first. Yet artists learners, risk takers, and observant people themselves. In time those who want to be part of this new crypto-art movement will learn the ins and outs as lifelong learners. 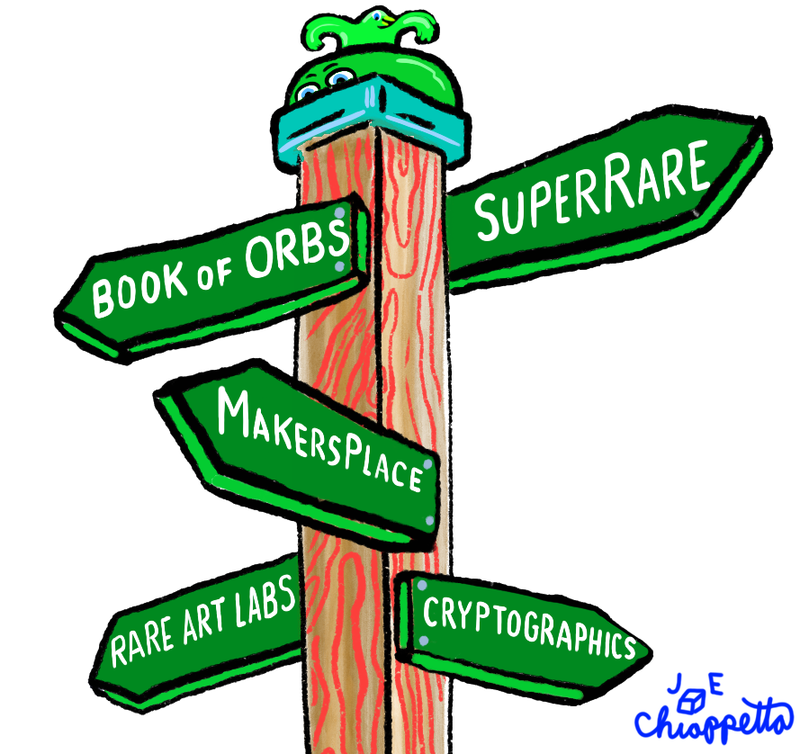 Calling All Infant Crypto Experts is rare digital art by Joe Chiappetta available on MakersPlace. Original images for this animation were started from pixEOS drawings. I hope this introductory article on how artists are migrating their business onto the blockchain for increased growth has stirred your curiosity--to say the least. In all my years as an artist I have never seen so much rapid development and economic opportunity for the creative mind. There is no way to tell how rapidly these markets will grow. Neither is there any way to determine which of the opportunities discussed here will be the most beneficial. Therefore, over time, perhaps look into each category. Test the crypto-waters, so to speak. As for me, I will be looking forward to these and probably many more art innovations as crypto-markets mature and increase in adoption. 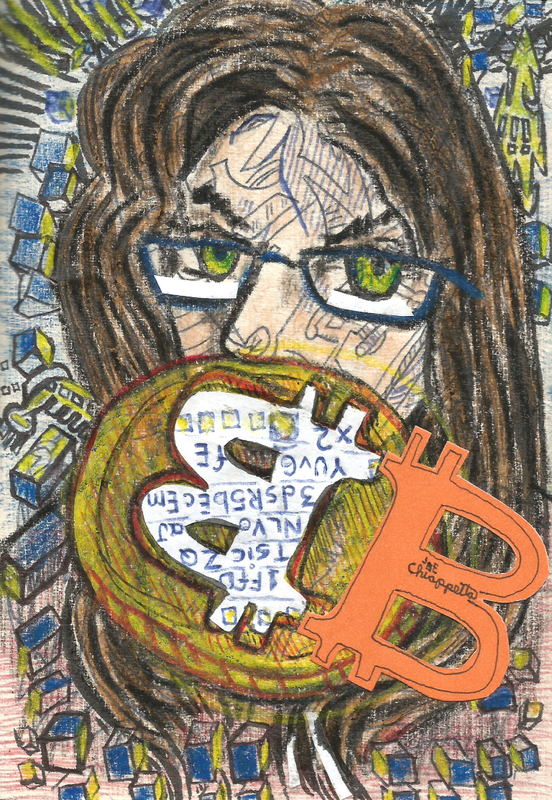 Hopefully, I will see you around the crypto-art universe too!